A laser is a device that produces an unusually powerful beam of light that does not exist on its own in nature. Today this light is used to perform thousands of useful tasks. A laser can give off a light beam that blasts through a thick metal wall or bores a hole in a diamond. Some lasers can measure things seen only under a microscope or even perform delicate eye operations. Every day, lasers are used in communications, factories, hospitals, and various entertainment media. In fact, lasers make our lives better and easier in so many ways that scientists have come to refer to these devices as the supertools of the modern age. The invention of the laser was the result of many ideas and discoveries, each building upon the ones that came before it, going back more than a hundred years. Scientists did not purposely set out to invent the laser; in fact, no one seriously considered such a device until just a few years before the first laser was built. Most of the ideas that led to its invention were the results of attempts by scientists to learn more about light and how it behaves. As time went on, the idea that light might be made more powerful, or amplified, became more important to scientists. Only when a few researchers managed to put all these accumulated ideas together in a very special way did it occur to them that something like a laser could be built. The first important attempt to get light to perform a task that lasers perform today came in the year 1880. Noted American inventor Alexander Graham Bell performed an experiment that showed how light might be used to carry a person's voice from one location to another. To accomplish this, Bell used a device he called a photophone, which consisted of a thin mirror, a receiver that could detect light, some wires, and an earpiece. Bell placed the mirror so that sunlight reflected off of its surface and traveled more than one hundred feet to the receiver. When a person spoke near the delicate mirror, it vibrated slightly. This caused the sunlight being reflected into the receiver to vibrate, too. The receiver then changed the light vibrations into an electrical signal, which traveled through the wires to the earpiece. 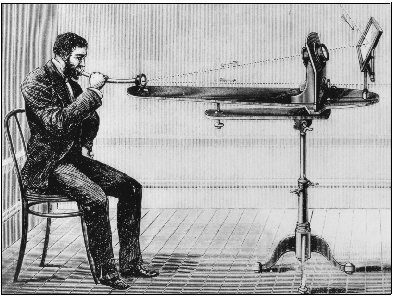 A man demonstrates Alexander Graham Bell's photophone, a crude but ingenious attempt to make light transmit a human voice. Unfortunately the photophone did not work very well. Bell's receiver was very crude compared to the ones used today. Also, the device relied on sunlight, which varies in brightness from hour to hour and from day to day. Obviously, on cloudy days or at night the device could not be used at all. Bell also had to contend with the fact that scientists at that time still did not know enough about light in order to use its power. What they did know was that light always travels at a set speed, which happens to be about 186,000 miles (300,000 kilometers) per second. This is so fast that a beam of light can race around the earth almost seven and a half times in a second. But in order to use light as a tool it was not enough to know how fast light travels. People also needed to know what light is made of. Back in the 1600s English scientist Sir Isaac Newton had suggested that light was made up of tiny particles. This explanation became known as the particle theory of light. At about the same time, Dutch scientist Christian Huygens said that light might be composed of waves, similar to the ocean waves that roll onto a beach. Scientists dubbed this the wave theory of light. Unfortunately, in Bell's day scientists still argued over which of these theories was correct. Through a mixture of hard work and genius, however, Bell managed to build a working photophone. The device itself operated on principles different from those that would later be used in the laser. Yet Bell had demonstrated that light might someday be used in communications. This idea prepared the way for the next step toward the discovery of the laser. 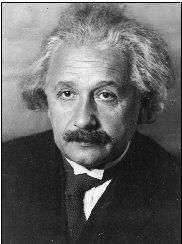 In 1905 German scientist Albert Einstein announced his own theory about light, namely that it is made up of both particles and waves. Einstein claimed that the particles, called photons (from the Greek word for "light"), move along in wavelike patterns. Later, other scientists performed experiments that proved Einstein was right. Einstein himself then went on to predict some more startling things about light, first and foremost how photons are made. He agreed with some other scientists of his day about how light sources (like candles, light bulbs, or the sun) produce photons. The researchers thought that atoms (the tiny particles that make up all material in the universe) give off photons. Some form of energy—such as heat, electricity, or chemical energy—might "excite" an atom, or make it more energetic. It would then emit (give off) a photon. Afterward, the atom would go back to its normal, unexcited state. Because there are huge numbers of atoms, they give off equally large numbers of photons. A 100-watt light bulb gives off about 10 trillion photons every second. Physicist Albert Einstein suggested the concept of the stimulated, or amplified, emission of light. In 1917 Einstein suggested that while an atom is excited it might be stimulated (coaxed) to produce a photon. If enough atoms could be excited and stimulated, a great number of photons might be produced. A beam of light made up of so many photons would be highly concentrated and therefore brighter and more powerful. Einstein called this process "stimulated emission of light." Because it can produce light that is boosted in power, or amplified, stimulated emission is the basic principle of laser operation. Scientists had the basic information they needed to build a laserlike device as early as 1917. But no one actually attempted it. Researchers thought it would be too difficult and expensive; and they were right. The advanced machinery they needed did not exist at the time and would have to be developed piece by piece. The necessary research would take many years and cost a lot of money. Of course, such time and money would be worthwhile if the idea promised to be useful enough. But the vast majority of scientists at that time did not think the idea of amplifying light would lead to anything practical or useful. For this reason, the development of lasers occurred in a more roundabout way—through experiments with radar and microwaves. 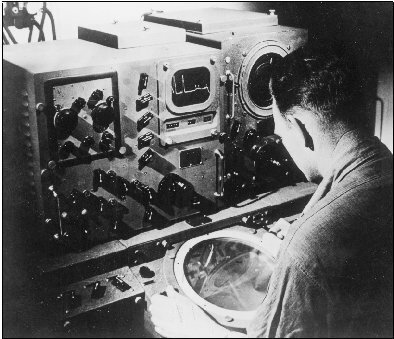 A naval technician tests radar equipment in August 1945. Experiments with radar led to technical advances that eventually produced the laser. in waves. But unlike light, which people can see, microwaves are invisible to the eye. After a radar beam bounces off an object the reflected microwaves return and register on a screen. By studying the screen a radar operator can tell the general size and distance of the object. This is how soldiers located enemy airplanes during World War II. As the war dragged on American military scientists tried to find ways of producing more powerful microwaves. Led by Dr. Charles Townes, these researchers found that microwave radiation does not work very well for radar because the waves are too easily absorbed by water vapor in the air; and as the beam travels farther more of it gets absorbed, so it gets too weak to do any good. But in a way, these experiments had not failed. They had made Townes very interested in learning more about microwaves, research that would eventually lead to the laser. In 1947 Townes began teaching and doing research at Columbia University in New York City. He remembered what Einstein had said about the stimulated emission of visible light—that many atoms could be stimulated to produce many particles of light. Since microwaves are so similar to light, Townes reasoned that stimulation might also produce many microwave particles. If the microwaves could be produced by stimulation, perhaps enough of them could be built up to get an amplified beam. But what would be the purpose of such a beam? Townes was not sure it would have any practical uses, but he reasoned it would be an effective research tool to aid scientists in studying how atoms give off radiation. 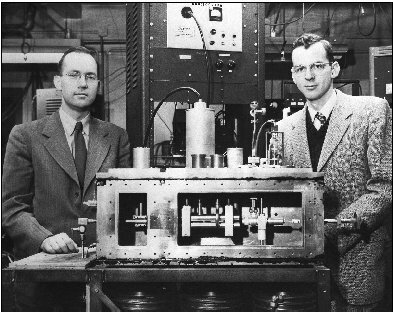 Charles Townes (left) and James P. Gordon proudly display their maser, a device that greatly amplifies microwaves. that when molecules of ammonia became excited (by heat, electricity, or chemical energy), they could be stimulated to emit microwaves of the type he was working with. He knew this process would be almost identical to the one Einstein described for stimulating visible light. The only difference was that Townes would be using microwaves instead of light. He calculated that if the ammonia molecules could be kept in an excited state long enough, they might be stimulated to produce more and more microwaves. Eventually, the waves would become concentrated and more powerful. In short, the microwaves would be amplified. Townes decided to try to build a working model. He enlisted the aid of two other researchers, Herbert J. Zigler and James P. Gordon. Working diligently, by 1954 the three men had a working device that operated in the following way: First, some ammonia gas was heated until many of the molecules became excited and then were separated from the unexcited molecules. Next, the excited molecules flowed into a chamber called the resonant cavity (or resonator) where the stimulation of the molecules took place. As the excited ammonia molecules began to emit microwave particles, the particles began to bounce back and forth inside the chamber. When one of these particles came near an excited molecule, the molecule suddenly gave off its own particle. Thus the particles themselves stimulated the production of more particles. Soon the number of particles doubled, then doubled again and again until the microwaves in the chamber had become very powerful. The entire process took only a tiny fraction of a second. Out of a hole in the resonator shot a strongly amplified beam of microwaves. The scientists called their invention a maser. The letters of this acronym stand for m icrowave a mplification by s timulated e missions of r adiation. The ammonia maser had only a few practical uses. First, because the ammonia molecules in the maser vibrated at a steady rate, the device could be used as a reliable timekeeping device. Second, because the maser was an amplifier, it could boost the weak microwave signals given off by distant stars, making it easier for astronomers to study such signals and learn more about stars. Townes and other researchers did not know it then, but the most important thing about the maser was that it set the stage for the development of the laser. All the right ingredients needed for the laser had been combined in the maser except for the most important one—light. In the mid-1950s, soon after the introduction of the maser, some researchers began talking about a device that would stimulate atoms to emit photons of light, exactly as Einstein had described. The photons would then be amplified to produce a powerful beam of light. A maser amplifies, or increases, the number of photons that cause invisible electromagnetic waves known as microwaves. First, heated ammonia gas is pumped into the maser. There, "unexcited," or low-energy, molecules are drawn to the sides of the maser. Only "excited," or high-energy, ammonia molecules flow into the resonator, or vibrating chamber. In this chamber, the excited molecules begin to emit microwave photons. These photons bounce around in the resonator, striking the ammonia molecules so that they remain excited and produce more and more microwaves. One researcher who wanted to learn how to amplify light was the father of the maser, Charles Townes. In September 1957 Townes drew a design for a device he called an "optical maser" (the term laser not yet having been coined). He then called another scientist, Arthur Schawlow, and the two men began drawing up more detailed plans for the optical maser. Townes and Schawlow were not the only ones working on the laser idea, however. Nikolai Basov and Aleksandr Prokhorov in the Soviet Union were also exploring the idea, and Gordon Gould, a graduate student at Columbia University, was thinking about developing his own light-amplifying device. In November 1957, only two months after Townes had sketched the optical maser design, Gould wrote down in notebooks all his ideas for his own proposed invention. The first thing he wrote was a name for the device. He called it a laser, which stood for l ight a mplification by s timulated e mission of r adiation. Other researchers thought of this name on their own, but apparently Gould was the first to coin the term. Hearing that Towne might also be working on lasers, Gould got worried. Naturally, he did not want someone else to get credit for what he considered to be his own invention. He showed his notes to a lawyer who specialized in patents. (When the government grants a person a patent for an invention, it recognizes that person as the original inventor. The person who holds the patent can also make a lot of money if the invention is successful.) Unfortunately for Gould, the lawyer did not understand the information in the notebooks and gave Gould the mistaken idea that he needed a working model of his invention in order to get a patent. Gould was not sure what to do next, so he just waited. This turned out to be a mistake because in the meantime Townes and Schawlow had been hard at work. They applied for their own patent in the summer of 1958. They also wrote a paper explaining their ideas and had it published in a famous science magazine. Gould had not published a paper; and when he finally did apply for a patent, almost a year had elapsed since Townes and Schawlow had obtained their own patent. So no one believed Gould later when he claimed he had come up with the idea for lasers on his own. By 1960 many scientists, including Townes and Schawlow, Basov and Prokhorov, and Gould, had asked for laser patents. In addition, the paper published by Townes and Schawlow had caused widespread interest in lasers in the American scientific community. Researchers in labs around the country raced to be first to construct a working model. The first successful device appeared on July 7, 1960, built by a previously unknown researcher who had worked totally on his own—Theodore H. Maiman of the Hughes Aircraft Company in Malibu, California. Maiman knew that the atoms inside the ruby would need to be excited somehow. In the maser, the excitation method had been heat, but heating a ruby would only cause it to break. Searching for an alternate method, Maiman noted that light passes through a ruby, and he wondered if ordinary light itself could be used as the excitation device. Maiman rigged a powerful flash lamp so that it ran through a glass tube. The tube was bent into the shape of a coil and wound several times around the ruby. When the lamplight flashed, the photons excited the atoms in the ruby, and these excited atoms became stimulated and gave off their own photons. Maiman had accomplished the first step in the lasing process. He had stimulated the atoms in the medium to produce photons. But to amplify the light, he needed to increase greatly the number of photons being produced. In the maser, amplification had occurred inside the resonant cavity where the particles bounced back and forth. In Maiman's laser the ruby itself acted as the resonator because it contained the excited atoms. However, there was nothing in the ruby for the photons to bounce off of. Furthermore, the ruby was nearly transparent. The photons created would just pass through and escape. Maiman had to figure out how to make the photons bounce back and forth and also how to keep them from escaping. He accomplished both of these goals in a very simple way: As the ruby was shaped like a cylinder (something like a long soup can but much smaller), Maiman coated each end of the ruby with silver. The ends then became mirrors pointing toward the center of the ruby. Because the mirrors faced each other, the photons bounced back and forth through the ruby over and over again. A ruby laser works much like a maser. But instead of microwaves, it produces an intense beam of visible light. This occurs when the molecules of an artificial ruby are "excited" by a flash of ordinary light from a flash tube, which surrounds the ruby. The "excited" ruby molecules begin to emit photons of visible light. The photons reflect off of mirrors located at both ends of the ruby. The reflected photons continue to excite more and more ruby molecules, thus producing more and more photons. This production of photons amplifies the light inside the ruby. The mirror on one end of the ruby is only a partial, or half-silvered, mirror, so some of the light passes through it. This light is the laser beam, or beam of amplified light. The next problem Maiman faced was how to allow his beam of amplified light to get by the mirrors and escape. His solution was to make the coating of silver on one end of the ruby very thin so that it became only a partial mirror, reflecting some photons back into the ruby while allowing others to escape. The ones that escaped became the actual laser beam. To Maiman's delight, the beam of strange deep red light shot out of the laser and registered on a nearby detector. As in the maser, the entire process happened extremely fast—in only a few millionths of a second. Maiman immediately asked a scientific journal to publish the results of his experiment. But the editors of the journal did not realize the importance of the work and refused to publish the paper. So Maiman approached the editors of a British journal, Nature, and they agreed to publish his three-hundred-word article. Not surprisingly those few hundred words excited scientists all over the world, and dozens of labs began to build their own laser devices, initiating a new scientific era. Researchers quickly realized that other materials besides the ruby could be used as laser mediums. The first gas laser used a mixture of helium and neon gases; and many other types of substances, including crystals, carbon dioxide gas, vaporized metal, and even colored dyes, became laser mediums. As more and different types of lasers were developed, scientists started thinking of tasks for lasers to perform. People in communications, industry, medical labs, and the military all rushed to find ways they might benefit from the new type of light. Astronomers wanted to use lasers to study the sun and stars; engineers wanted lasers to cut and weld metal parts; doctors saw potential for lasers in performing eye operations and burning away tumors; military leaders thought lasers might be developed into death rays to shoot down enemy planes; and so forth. The laser also promised to benefit its inventor with a great deal of prestige and money. The problem was that several researchers had come up with the idea at about the same time. This made it difficult for the U.S. Patent Office to decide who the actual inventor was. As it turned out, Townes and Schawlow received patents for the basic laser principle, and Maiman received a patent for the ruby laser. However, because he had applied so late, Gould did not receive a patent; so he took the case to court. The legal battle dragged on for years. 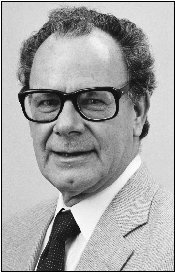 Dr. Gordon Gould, who coined the term laser in the 1950s, fought for recognition as one of the device's inventors. Gould had even more to be upset about. In 1964 the famous Nobel Prize for physics was awarded to the men who had created the original designs for lasers. Three men shared the prize: Townes and the two Soviet scientists, Basov and Prokhorov. Again, Gould had been left out; and again, he refused to give up. Although he had to borrow large sums of money to continue the legal fight, it eventually paid off. In 1977 and 1979 Gould received patents for two small parts of the lasing process. Finally in 1988 the patent office granted him the major patent he had applied for back in 1959. And so, along with Townes, Schawlow, Maiman, Basov, and Prokhorov, Gould was at last recognized as one of the founding fathers of the laser. Alexander Graham Bell was a noted Scottish Inventor who was born in Scotland and educated in Scotland who emigrated to Canada and passed away in Canada. Yes some of his work was done in America just like Albert Einstein. Can you please amend.